Medical malpractice and personal injury law firm Lubin & Meyer PC, has been awarded two Tier 1 rankings in the inaugural publication of U.S. News & World Report – Best Lawyers “Best Law Firms.” The firm received Tier 1 rankings in Medical Malpractice Law (Plaintiffs) and Personal Injury Litigation (Plaintiffs). 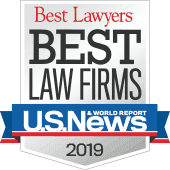 Lubin & Meyer, with attorneys licensed to practice in Rhode Island, Massachusetts and New Hampshire, is recognized as one of the country’s leading medical malpractice and catastrophic personal injury law firms. Lubin & Meyer’s innovative style has won more than $550 million in verdicts and settlements in just the past ten years. Lubin & Meyer is distinguished by it creative, innovative and aggressive approach to cases that makes the firm a winner in both the courtroom and in settlement negotiations. The firm has obtained record setting verdicts and settlements in countless difficult cases, many of which had previously been rejected by other attorneys.